Casino Peak is located in the White Cloud Mountains, just east of Stanley Idaho. It is the westernmost peak in the White Clouds, and is unofficially named after the Casino Lakes that sit at the foot of the peak. Casino Peak isn’t overly striking all on its own, but the views certainly are. The views from the summit include numerous ranges, highlighted by a bird’s eye view of the northern White Clouds, and probably the best seat in the house to check out the jagged peaks along the Sawtooth front. Splattski and I left Boise shortly after 4am and made it the to the Boundary Creek pullout slightly after 7am. Highway 21 had been closed for most of the prior day due to avalanche risk, so we opted for an early start to keep our options open just in case. Since the sun wasn’t up yet, we got to test out our clothing in sub-zero temperatures at the start of the hike. The highlight at this point in the morning was the predawn lighting and a moon setting behind the Sawtooths at our backs. It was pretty cool (pun intended). After following some ski tracks until just beyond the summer trailhead, we crossed the creek and headed south to get the base of the west ridge. The snow had decent crust on it, so we made good time up through a grove of Aspens then up the ridge. We probably could have made even better time, but the morning sun starting to hit the Sawtooths mesmerized me, and I paused often to take in the view. With the recent avalanche activities in the region, we stuck to the southern side of the ridge to take advantage of the sun crust that provided stable conditions. This also kept us out of the powder and lessened the workout a little. I wasn’t doing too bad, but hit a wall at about 9000’. A lessen learned for me was that you should try to get more than 3 hours of sleep the night before doing a snowshoe ascent with a dude who has been training for Denali. John had been breaking trail most of the way anyway, but now he was really starting to leave me in the (snow) dust. As we approached a knob on the ridge, I thought for sure it was time for some summit views, but no luck. At least we could finally see the true summit, still a half-mile to the south. Fortunately the grade had lessened, and we made our way up and down snowdrifts along the ridge on our way to the highpoint. The views from the summit were excellent. It was a great vantage point to check out the northern White Clouds, Salmon River Mountains, and the Sawtooths. We could even make out the Boulders, Pahsimeroi’s, and northern Lemhi’s. It was a bit breezy on top, but not too bad. The descent was uneventful, and we took a leisurely pace on the way down while shooting the breeze and slowing frequently to check out the in your face views of the Sawtooths. We made it back to the car at about 2:30pm, seven hours round trip. Map of our route, covering just over 9 miles round trip & 3400' elevation gain. 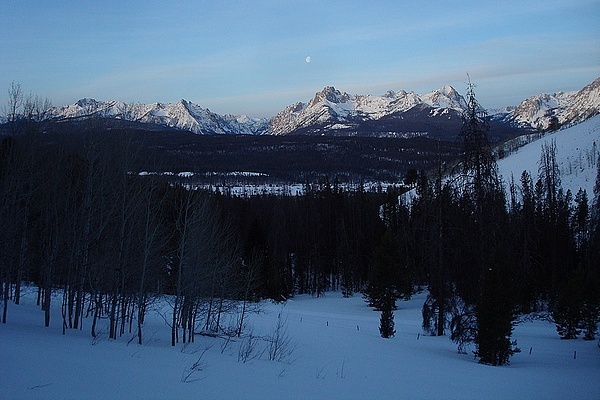 Looking back at the moon over the Sawtooths, not far from the trailhead. The moon over Mount Heyburn. Our early start rewarded us with some neat lighting. John climbing into an Aspen grove. Snowshoeing along the west ridge. John taking a break on an rock outcropping at around 8000'. Black and white shot of John hiking into the sun. Heading south along the ridge, with the summit finally in view. Panoramic view of the northern White Clouds from the summit of Casino Peak. The crux of the descent, with the Sawtooths in the background.